Revealing the inherent molecular diversity of lipid biology requires advanced analytical technologies. Distinguishing phospholipids that differ in the position(s) of carbon-carbon double bonds within their acyl chains presents a particular challenge because of their similar chromatographic and mass spectral behaviours. Here—for the first time—we combine reversed-phase liquid chromatography for separation of isomeric phospholipids with on-line mass spectral analysis by ozone-induced dissociation (OzID) for unambiguous double bond position assignment. The customised tandem linear ion-trap mass spectrometer used in our study is capable of acquiring OzID scans on a chromatographic timescale. 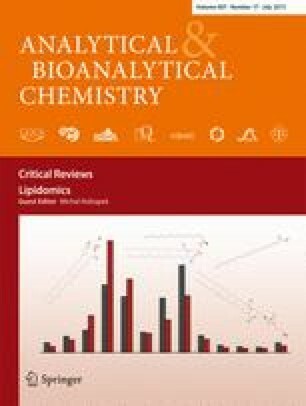 Resolving the contributions of isomeric lipids that are indistinguishable based on conventional mass spectral analysis is achieved using the combination of liquid chromatography and OzID. Application of this method to the analysis of simple (egg yolk) and more complex (sheep brain) extracts reveals significant populations of the phosphatidylcholine PC 16:0_18:1(n−7) alongside the expected PC 16:0_18:1(n−9) isomer. The online version of this article (doi: 10.1007/s00216-014-8430-3) contains supplementary material, which is available to authorized users. RLK is grateful for support through an Australian Postgraduate Award (International) from the University of Wollongong. TWM is an Australian Research Council Future Fellow (FT110100249). SJB and TWM acknowledge project funding from the Australian Research Council through the Discovery (DP120102922) and support from AB SCIEX through the ARC Linkage Program (LP110200648). RLK acknowledges the technical support of Dr Chris Hodgkins (AB SCIEX, Australia) and Dr Alan Maccarone (UOW) and also thanks the latter for provision of Fig. S1. TWM, JLC and SJB conceived the project. RLK conducted all experiments and performed the data analysis. JLC provided essential input into the experimental configuration including hardware and software aspects. RLK and SJB wrote the main manuscript text and prepared figures. All authors critically reviewed the manuscript and electronic supplementary materials.